Designed by Pete and Alice Dye, the Long Cove course opened in 1981 with rolling, tree lined fairways, challenging greens and water featuring prominently in the course design. The residential community at Long Cove Club is spoiled for choice when it comes to on-site sporting activities – there’s tennis, boating, fishing, kayaking and swimming but the jewel in the crown is their private golf course. Members here consider there is no single signature hole as there are so many contenders to choose from. Dye constructed the Bermuda grass fairways at Long Cove to be wider than on previous designs, with more room for ordinary golfers to remain in contention. Dye shifted plenty of soil, in fact, a young Tom Doak worked here on his first construction project in the summer of 1981. The course was reshaped at one end of the site to imitate sand dunes, presenting a totally blind approach shot at the 5th hole for everyone but the bravest player. Long Cove’s Tifdwarf grass putting surfaces are larger, and more contoured than earlier Dye course designs but the two holes at 13 and 14, along Calibogue Sound, are reminiscent of low profile design features at Dye and Nicklaus's Harbour Town course. Long Cove elicits many favourable comments from ordinary golfers who play here – “surroundings are magnificent… as pretty as any course you will play… lots of risk/reward choices”. So why not post your own review if you’ve played Long Cove? We were in for more Pete Dye golf at Long Cove, but this course was a treat, even though I was a bit tired since it was our second 18-hole round of the day… The first hole had water all down the left side. Finally, on Number 4, we came to a hole without water directly in play. But that didn’t last long. We soon discovered that water or marsh came into play on much of Long Cove. Yow! Keep it straight. Long Cove is long, narrow, and challenging with water in play on 12 holes. It plays like three different courses: tree-lined holes, almost desert-like holes, and holes with marsh and Intracoastal Waterway. It’s quite impressive. The houses are set back unobtrusively and the grounds are home to wildlife galore; it’s a bit like walking through a bird sanctuary. I would love to return to play here one day when I am fresh. Larry Berle. The water is on the right side of number 1 fairway! 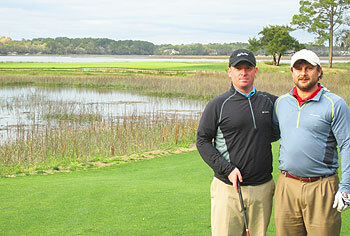 Long Cove Club is a beautiful track, the most impeccably maintained course in Hilton Head South Carolina. The course plays long, but fair, greens were perfect, and the scenery as you travel along the course is filled with beautiful marshes, creeks and Spanish and Mossy oaks. Pete Dye also added some of his love of his mid west tracks like Whistling Straits, or French Lick adding some rolling hills, and the confusion off the tee box at number 2 to try and decide what to do, as the fairway provides limited ability to hit your second shot in nice comfortable lye, and your trying to hit a green which borders the creek and alligators watching in the gallery, and dares you to attack it. The back nine provides an amazing run along some beautiful holes, which force you to fly some over water to shorten the distance to the hole like number 14 my favorite following the beautiful signature par 3 13. I would recommend it to anyone to play. Bob Patton the Head Professional was very helpful and courteous to our group, and offered plenty of advice and hospitality to us all. Hope to head back there next year after another trip to Afghanistan. One of my buddies is a member here at Long Cove and for me it’s a better course than Harbour Town or Kiawah that were also laid out by Pete Dye. Every hole at Long Cove is like a remarkable signature hole and as a collection of 18, perhaps the most challenging course I’ve ever played. This is also a no frills club that is really genuinely friendly and I’d certainly want to be a member here if I lived in SC.